halloween handmade with the cricut maker — hello, y'all. raise your hand if you have a sweet tooth? i certainly do! 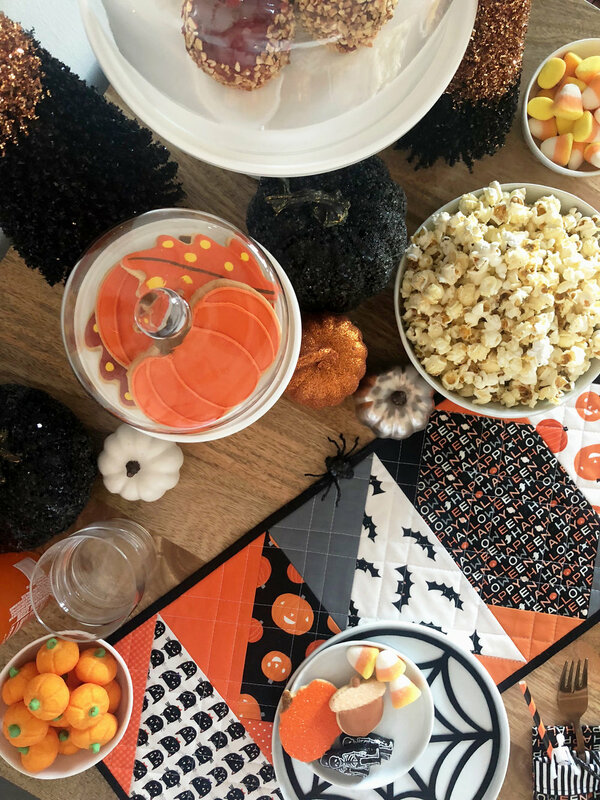 well, this project, using the cricut maker will surely give you a sugar rush! 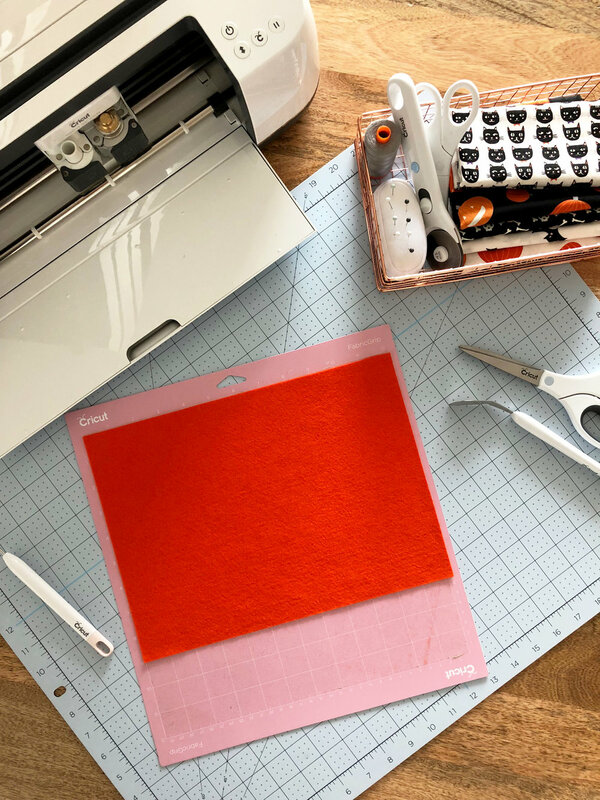 any holiday can be handmade with the rotary cutter, knife blade, and scoring wheel from cricut. 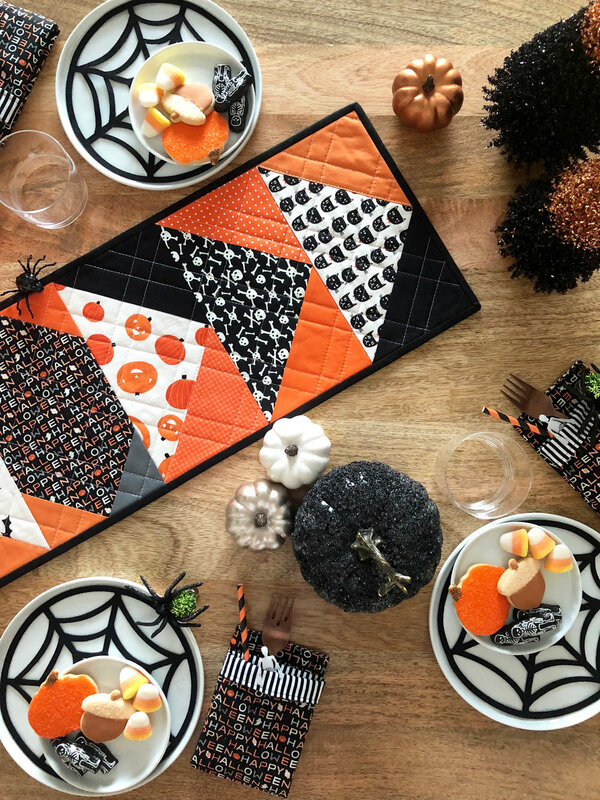 it cuts through just about any fabric and makes decorating for the holidays a snap, especially with the unboolievable amount of cricut artwork you have to chose from. 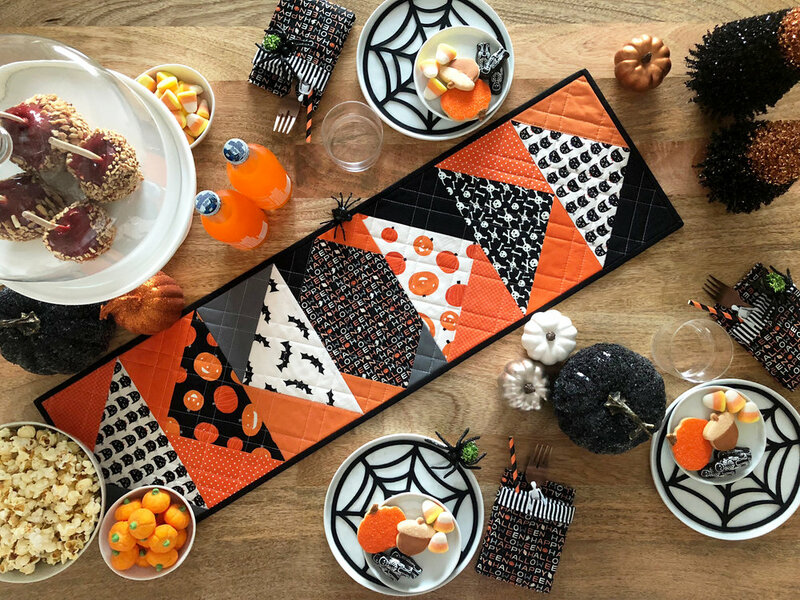 i decided to invite a few of my friends over for a spooktacular party and why not spruce up the table with a faboolous table runner and plate charger? it’s too cute, right? side note: are you over my candy corn-y halloween jokes? hahaha! 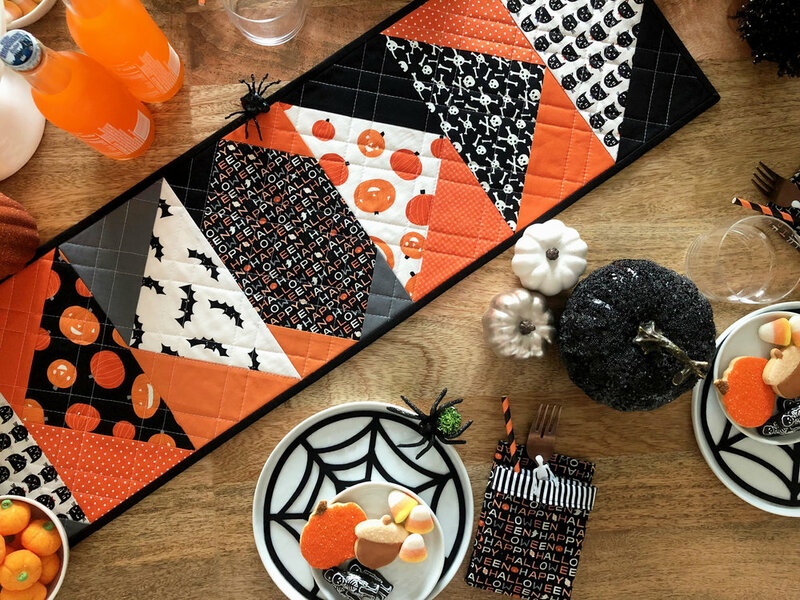 the cats, bats, and jacks fabric collection from riley blake designs. 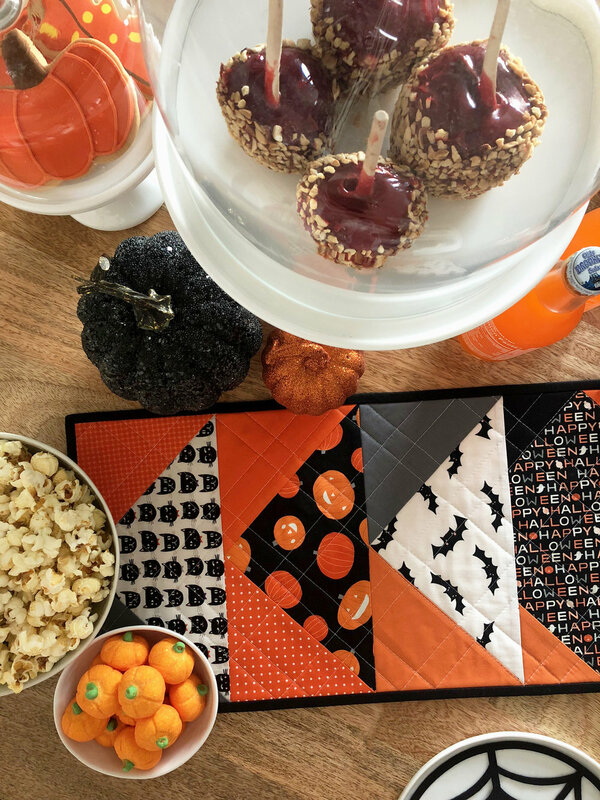 the confetti cottons fat eighth’s halloween box from riley blake designs. a flying geese foundation paper piece template i designed in cricut’s design space. it came together in a snap and the plaid-like quilting really made it pop! i love it. and let’s give a shout out to cricut’s bright pad, it’s great for FPP! okay, so, i have confession. i didn’t make these, jack did, and they’re awesome! he cut a 13’’ square for the front and for the back. placing right sides together, he sewed a 1/2’’ seam around all sides but one. turned the napkins right-side out and top stitched completely around the napkin. i folded them in half and turned down the side to create the pocket. i’m dead. so cute. spider web art from cricut’s design space. i pre-measured my plate so i knew it would fit perfectly! it’s amazing! banner art from cricut’s design space. circles from the shapes panel in cricut’s design space. i used ribbon to join the banner’s together. the confetti is sewn together with invisible thread. it was the perfect way to not add another element to the confetti. so cute, right? okay, well, i better go eat these cookies before they’re all gone. i hope you enjoyed this fun halloween project as much as i enjoyed making. stay tuned for a creep-tastic project using cricut’s knife blade.